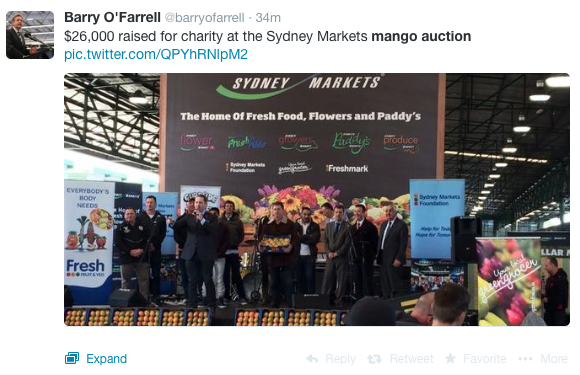 The Sydney Markets 'First-Tray' Auction was an overwhelming success. 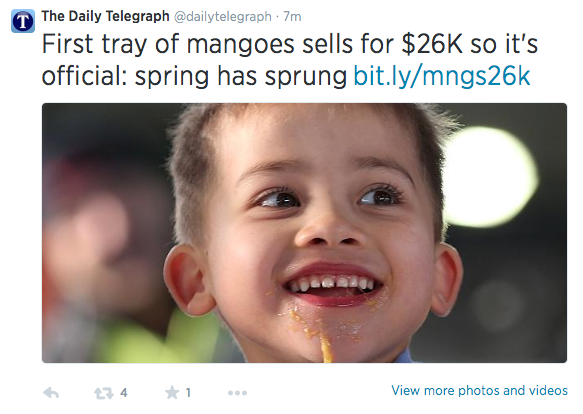 Not only did the first tray of mangoes fetch $26,000 for charity, but it also flooded social media, making sure that Australians everywhere know that mango season is almost here. The Sydney Auction built anticipation and got people excited about the start of the mango season, which isn’t far away, and the Brisbane Auction will let people know that the season is here and it's time to go buy your mangoes! Mr KP mangoes were donated by WePack and Red Ridge. Congratulations to the Australian Mangoes Marketing Team, who made the event a success. Not only was social media abuzz with the Auctions, the event was featured during the weather of the Today Show, reaching an audience of around 328,000 and highlighting the charities involved - Save Our Sons, Prostate Cancer Foundation and the Sydney Markets Foundation. The Daily Telegraph also featured the auctions on their social media accounts and website. The first-tray of mangoes was sold for $26,000 to a syndicate of Sydney Market wholesalers, including Vegie World, Aussie Roma, Harvest Fresh Australia, Rustom Fresh, J and J Fruit, Zaidan Fresh Produce. The mangoes that were auctioned were donated by WePack, based in Darwin, and Red Ridge, a wholesaler in the Sydney Market. The Aussie Mangoes Facebook Auction Winners post received 929 likes, 114 shares and 53 comments. Click here to see the Mango eating competition and more coverage on Instagram. Newer PostTraining video: "Mango Picking - How To Do It Right"